Wayne Hammer’s seat-of-the-pants panorama that helped defeat the Noisy Face Timber Sale in 1984. 1984: Swan Range residents formed the nonprofit Swan View Coalition to oppose Flathead National Forestâ€™s Noisy Face Timber Sale and motorized abuse of the area. 1985: Stopped permanently the Noisy Face Timber Sale, which would have carved up to 30 miles of new logging road and twelve unsightly 20-acre clear-cuts on the Swan Face between Lake Blaine and Ferndale. 1986:	Secured upgraded designation of Swan Range and Swan Valley grizzly bear habitat to highest-priority Management Situation One (MS-1) in the Flathead Forest Plan. 1987:	Lawsuit secured closure of 3,500 acres of MS-1 springtime grizzly bear habitat in the Krause Basin area to motorized vehicles from April 1 â€“ July 1 pending completion of the Flatheadâ€™s Noisy Face Recreation Plan. 1988:	Secured spring and fall closure to motorized vehicles of MS-1 grizzly bear and elk habitat in Krause Basin from April 1 â€“ July 1 and September 1 â€“ November 1 in the Noisy Face Recreation Plan. The Plan also forbids traditional motorcycle races in the area, closes scores of unauthorized ATV trails and abandoned roads to motorized vehicles, and closes to motorized vehicles Echo Broken Leg, Crater Notch and several other trails leading to Jewel Basin Hiking Area. SVC inventoried and photographed 400 abandoned Forest Service roads in the Swan Valley and got them physically closed to motorized vehicles. 1989:	Filed lawsuit against the Flathead Forest Plan because planning records revealed the Flathead cannot produce the promised 100 million board feet per year (MMBF/yr) of timber while complying with its grizzly bear management standards. 1991:	Filed lawsuit because existing road densities on the Flathead National Forest harm grizzly bears in violation of the Endangered Species Act. Secured District Court injunction in a separate lawsuit against the hunting of threatened grizzly bears in the Northern Continental Divide Ecosystem because it was causing half of the known human-caused mortality. Fish and Wildlife Service then withdrew the hunt permanently. 1993:	Filed lawsuit against the Lost Silver Timber Sale in the northern Swan Range because the areaâ€™s South Fork Grizzly Bear Study shows road density standards more stringent than those in the 1986 Flathead Forest Plan are necessary. Ninth Circuit Court of Appeals rules on the 1989 lawsuit, ordering the Flathead National Forest to amend its Forest Plan after finding its 100 MMBF/yr Allowable Timber Sale Quantity arbitrary and incompatible with its grizzly bear standards. 1995:	Flathead Forest Plan Amendment 19 is issued in response to the 1993 Ninth Circuit ruling and to simultaneously resolve the 1993 Lost Silver and 1991 road density lawsuits. Amendment 19 lowers the 100 MMBF/yr Allowable Timber Sale Quantity by 10 MMBF/yr to better protect grizzly bear and by another 36 MMBF/yr to better protect big game and old-growth forest habitats - to 54 MMBF/yr. It also requires strict limits on total road density and open road density be met in all grizzly bear habitat by 2005, requiring road decommissioning and culvert removal to reduce total road density and protect watersheds. 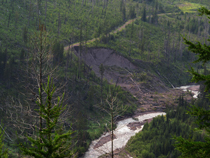 This replaces the Flatheadâ€™s intent to construct 75 miles of new logging roads each year, until its 4,000 miles of road reached 6,000 miles, with a road removal program and greater protection of roadless areas. 1996:	Hired consultants to train Flathead National Forest in state-of-the-art road decommissioning techniques that best protect and restore water quality. 1999:	Secured court order physically obliterating an unauthorized snowmobile trail illegally cut through Krause Basin and used to trespass illegally in Jewel Basin. 2003:	Filed lawsuit against Moose Post-Fire Project, which would leave ten culverts in otherwise decommissioned roads to facilitate snowmobiling and reopen an already closed road, both in violation of Amendment 19 and other grizzly bear standards. 2004:	Secured court order removing a snowmobile bridge installed over Lost Johnny Creek used to extend the snowmobile season and trespass illegally in Jewel Basin. 2005:	Filed lawsuit against the Robert-Wedge and West Side Reservoir Post-Fire Projects for their failure to schedule the closure and decommissioning of enough roads and motorized trails to meet Amendment 19 standards. Flathead announces it is far behind fully implementing Amendment 19 standards by 2005 and asks Fish and Wildlife Service (FWS) for a relaxed time line. 2006:	Filed lawsuit against the tardy implementation of Amendment 19 and the failure of FWS to provide a new firm time line to complete its implementation. Filed lawsuit against Flathead Forest Plan Amendment 24, which allows snowmobiling in grizzly bear habitat as late as May 31 in violation of Amendment 19â€™s closure of the snowmobile season on March 15, when bears begin emerging from their winter dens but females with young cannot yet flee. 2009:	Ninth Circuit Court of Appeals faults the Moose Post-Fire Project, ruling the Flathead indeed must comply with its Forest Plan and Interagency Grizzly Bear Guidelines requirement that agency decisions must â€œfavor the bearâ€ when its needs compete with snowmobiles, ATVs, roads, etc.. Flathead has since 1995 decommissioned 720 miles of damaging roads, made decisions to decommission another 160 miles, and is required to continue planning decommissioning in areas of grizzly habitat that remain substandard. 2011:	Stopped the spraying of 50,000 gallons of deadly pesticide on old-growth forests in the Swan Valley and convinced the Forest Service to instead use the harmless, pheromone-based verbenone to deter mountain pine beetles. You can read more about this pesticide issue in our Winter-Spring 2011 newsletter!